Upper Neck Pain – What is it and what causes it? Upper neck pain is very common, and along with lower back pain is one of the conditions I treat most frequently. Symptoms can vary from dull aches all the way through to agonising pain, limited movement and chronic headaches. There can be many causes of upper neck pain, but I will be focussing on Forward Head Posture as the main cause of pain. It is as it sounds, the head has forward posture. If you were to look at someone from the side ideally their ears should be directly above the shoulder joint. There are many other variables within a person’s posture that would need to be taken into account, but that’s pretty much the crux of it. Forward head posture also ties in with a condition called Upper Cross Syndrome. I’ll probably talk about this further in a future journal entry. A brief description of Upper Cross Syndrome is forward head posture, rounded shoulders and a rounded upper back. Upper neck pain and upper cross syndrome are typically caused by or at least exacerbated by the things we do in our daily lives. Things like prolonged periods of sitting down, using mobile devices and driving can all be among the causes of these conditions. Ok, back to the upper neck pain. Have a look at the photo over on the left, notice all of the muscle attachments you can see under the back of the head. There’s quite a few and they’re just the ones you can see. 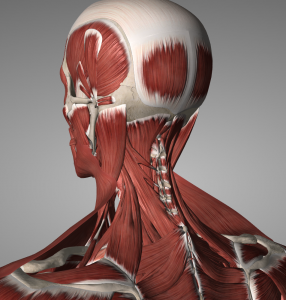 When our head is in a forward position many of those muscles are forced to lengthen to accommodate. When allowed to lengthen and weaken over time they can become painful. Sometimes the pain is nearer the shoulders, sometimes it’s in the middle of a muscle and sometimes it’s right there under the back of the head. And that’s not all that’s going on. The nicely spaced gaps between our neck vertebrae change to compress the discs more on one side than the other. Other muscles of the neck and shoulders have to lengthen and/or shorten to accommodate the forward position of the head. There’s a whole lot of things going on too, but there’s a wealth of information online about it and in the interest of keeping this post concise I’ll let you do any further research through your old pal, Google. Upper neck pain – How do we treat it? In order to forgo any lengthy rambling, I’ll summarise how I set about treating this issue. Massage – Well, I am a massage therapist. That said, massage has to be used correctly. Massage can be very effective at relaxing and lengthening muscles. Herein is where the problem lies. The muscles that a sore are perhaps already too long and massage will only further lengthen them, but in the first instance it’s the pain we’re trying to get under control and massage is a means to achieve that. Now, we can also use massage to lengthen short opposing muscles. So don’t be too miffed if a therapist is working on an area that isn’t painful. Although, you might want to ask just in case. Acupuncture – Can be hit and miss for some people, but I’ve generally found it to have quite a positive reduction on pain levels. It’s also a really handy goto option if an area is so painful that it can’t physically be touched. Stretching – I usually prescribe some stretches to help get things moving in the right direction. Much will depend on the person and the nature of their pain. Simple stretching exercise for the front of the neck and some simple mobilisation exercises can make the world of difference. Mobile device usage – Just the position of how you’re holding a device can make a difference. As can how long or how many times a day you use a device. Facebook won’t be as interesting without but the world will survive. Work – Our jobs can vary greatly, but it’s sedentary jobs that can really bring on upper neck pain and upper cross syndrome. Having a good long think about what you do at work and how you do it can make a huge difference. In fact, if your job is the primary cause of the issue ignoring it will always eventually negate the effects of any therapy. I can think of so many ways to fix these work-related precursors that I might even write a separate journal entry for them. I’m even sure I could think of at least 50 separate ways of improving and/or preventing these kinds of issue in the workplace. Medical Professional – When things are really bad I always recommend a medical professional to get involved in the treatment plan. Massage therapists aren’t medically trained and it would be unprofessional and inappropriate for us to diagnose anything. We’re trained, to varying degrees, to provide relief from pain. We can offer advice and opinion, but it’s only a medically trained professional that can give you a diagnosis. The measure of a good therapist is one who is prepared to not take your money in favour of doing the right thing and referring you elsewhere. Well, I hope I’ve helped explain some things about upper neck pain for you. There is a wealth of information out there on the subject, although probably best not learned from the internet. If you’re suffering from upper neck pain it’s doubtful it’ll get any better without something changing. Good news is though, the changes can be very simple and it’s treatable. Now, if you’ll excuse me. I’ve been sitting at my desk for too long.